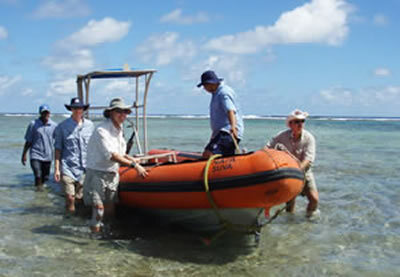 Niku IX is a TIGHAR-affiliated independent expedition organized and led by Dr. Tom King in association with a Betchart Expeditions tourist cruise to Nikumaroro. Dr. King, assisted by a staff of experts, will supervise on-shore research conducted by Betchart passengers. In addition, the National Geographic Society is sponsoring the use of four “forensic dogs” from the Institute for Canine Forensics. The dogs will search for human bones from which DNA might be extracted. 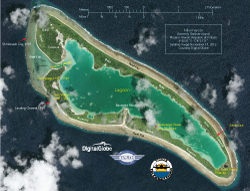 TIGHAR is supporting the expedition with research and assets for underwater search operations to find identifiable pieces of the Earhart Electra. Representatives from the Woods Hole Oceanographic Institution will also accompany the expedition to service underwater sensors collecting data on wildlife. To avoid lengthy download times, the updates are divided into seven day periods. This is the first week of the expedition. Date links refer to U.S. days. The second week starts on June 28; click "Week 2" below. Reef Endeavor is making making up lost time in unusually calm seas. The dog who was having a bit of a problem with seasickness responded well to medication and is now reportedly feeling fine. The expedition to arrive at Nikumaroro on schedule at 10:00am local time (6:00pm EDT) tomorrow. High tide will be at noon so they should be able to get a boat into the into the lagoon. Andrew McKenna and John Clauss will be meeting with the Captain and Bos’un today to plan that operation. The ship has crossed the International Dateline so, officially, today is now yesterday but they’ll probably stay on Fiji Time which means that today will continue to be tomorrow. Confused yet? At Niku, it really doesn’t much matter what day or time it is. A British District Officer who visited the colony after WWII was puzzled that the sun always came up at exactly 6 a.m. until he discovered that, each day when the sun came up, the people all set their clocks to 6 a.m. Yesterday (whatever day that was) the Woods Hole team, Sam Payet and Matt Gietbohl, explained the purpose of the shark survey they’re doing at Niku. Sharks are extremely important to the ocean’s ecosystem because they’re at the top of the food change but over-fishing has decimated their numbers worldwide. The deplorable practice of “finning” to meet the demand for shark fin soup – hooking the shark, cutting off the fin, and leaving the shark to die – has wiped out entire populations at some islands. Nikumaroro is one of the few places that remains relatively untouched by such depredations, so gathering data on its sharks provides a baseline for assessing damage elsewhere. The various archaeological teams that will be working on the island also spent some time yesterday testing their GPS units and working out radio protocols for communications during the expedition. Everyone is looking forward to tomorrow’s arrival with great anticipation. Sharks are a fact of life at Nikumaroro. They’re everywhere. Go fishing and you’re in a contest to see if you can land your catch before a shark beats you to it. Go SCUBA diving and you have a constant curious audience. Wade in the shallows and you’ll have a shadow on “your six.” Dabble your hand in the water on the lagoon shore and you’ll too have a visitor asking whether someone needs assistance. 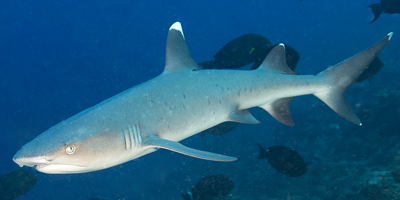 The sharks at Niku are reef sharks – Black Tips, Grays, and White Tips. Most are under five feet in length and not especially aggressive. The big, deep water fellows with more sinister reputations –Tigers, Bulls, and Pelagic White Tips – rarely come visiting. 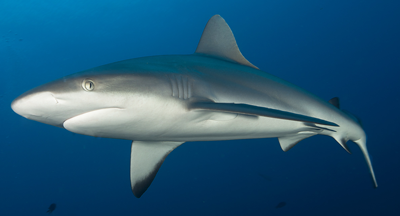 As the predators at the top of the food chain, the sharks are an essential element in the health of the reef, hence the data being collected on this expedition by divers from Woods Hole Oceanographic Institution described in yesterday’s update. Top left, Black Tip Reef Shark. Top right, Gray Reef Shark. Bottom left, White Tip Reef Shark. 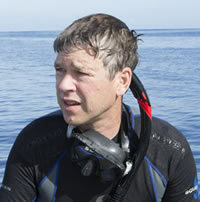 Andrew McKenna is the Dive Team leader on the Niku IX expedition and makes daily reports to Executive Director Ric Gillespie via satellite phone. He has been a TIGHAR member since 1990 and currently serves on the organization’s Board of Directors. The son of famous paleontologist Malcolm McKenna, Andrew’s archaeological eye was trained from childhood helping his father on fossil hunts in the Gobi Desert and other remote locations. 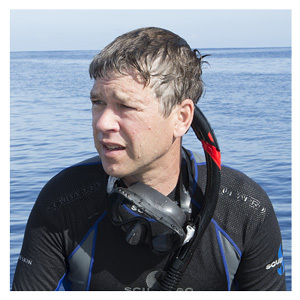 Andrew participated in underwater and onshore archaeological operations on four previous TIGHAR expeditions to Nikumaroro (2001, 2007, 2010, & 2015) and was on the TIGHAR team that surveyed the Maid of Harlech in Wales in 2007. On this expedition, Andrew will be checking the floor of Tatiman Passage for possible airplane debris and taking a second look at some sites off the reef in shallow water that were identified on the 2015 trip. A warm welcome at Rotuma yesterday with garlands of flowers, music and traditional dancing meant spending a bit longer than planned but the expedition is hoping to stay on schedule to arrive at Nikumaroro around 10:00 am on the 28th. Once the ship was back at sea, Tom King gave a lecture on the history of Nikumaroro and schooled the passengers on the names of the island’s various districts. Many more lectures will follow, covering topics such as archaeological discipline (“No. Don’t bring me what you found. Mark it and come get me.”) and how to properly set up your GPS device. 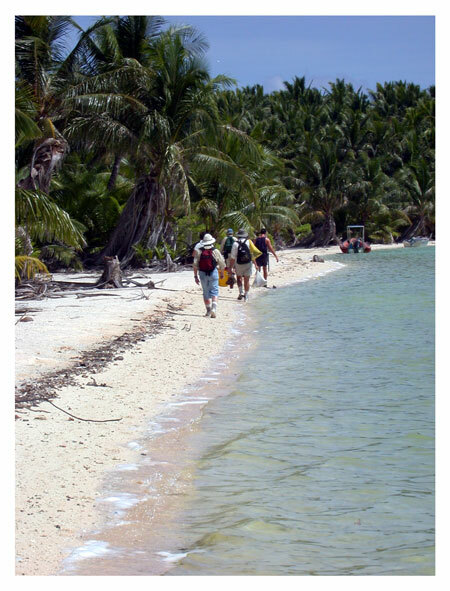 The lagoon at Nikumaroro is an excellent way to get to remote parts of the atoll without a long, hot walk. Step One is to get a skiff or launch into the lagoon by walking it from the landing channel, through Tatiman Passage, and across the sand delta at high tide. A base for lagoon boat operations is set up at Club Fred, a beach on the lagoon shore in back of the abandoned village with a drum of gasoline for refueling the outboard motor. 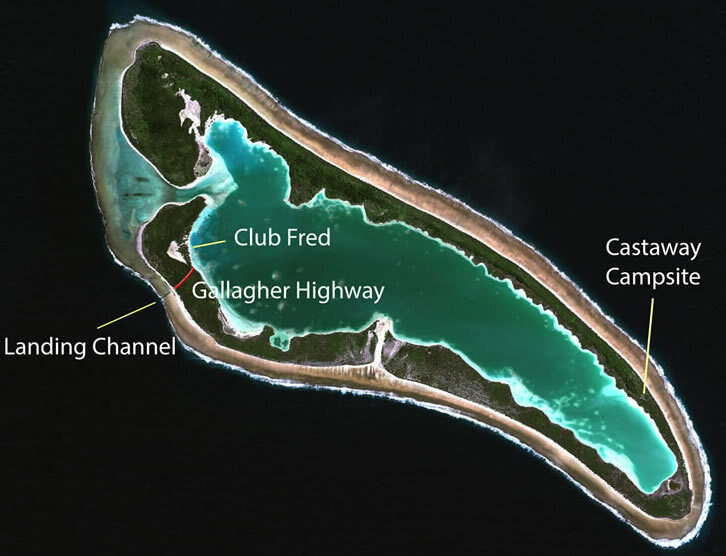 Step Two is opening the Gallagher Highway, a trail through the coconut jungle for moving people and gear from the head of the landing channel to the lagoon shore down the beach from Club Fred. 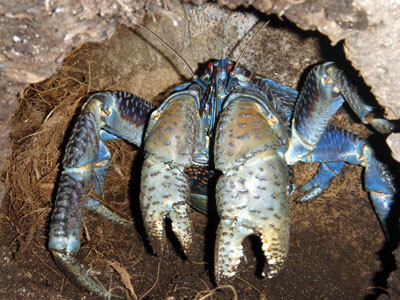 This usually takes about half a day of machete work and sometimes involves dealing with None Shall Pass, a large coconut crab who objects to people tromping through his domain. The daily commute from the ship to the Seven Site (castaway camp) where the dogs will be working involves going ashore at the landing channel, hiking the Gallagher Highway to the lagoon shore and Club Fred, then boarding the lagoon boat for the 20 minute ride to the far end of the atoll. John Clauss is a jack-of-all trades and master of all. 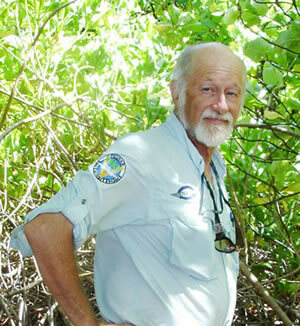 He has been a TIGHAR member since 1986 and served on expeditions searching Maine and Newfoundland for The White Bird. He was on the Maid of Harlech survey in Wales, the Electra crash site expeditions in Idaho and Alaska, the Kanton Island expedition, and the Solomon Islands oral history expedition. 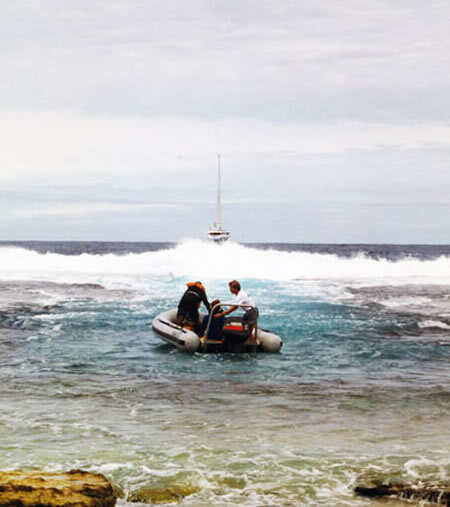 John has been on every Earhart Project expedition to Nikumaroro except one. Nobody knows Niku better than John. On this trip he’ll primarily be piloting the Trident OPEN ROV and working with Andrew McKenna to search Tatiman Passage for airplane wreckage, but his wealth of knowledge and experience will benefit all aspects of the expedition. If you support our efforts to solve the Earhart mystery please join TIGHAR. We need your help. Click here for several options. The replacement ROV arrived, was tested, and is working properly. After a late start yesterday due to Customs delays, M/V Reef Endeavor sailed from Fiji last night and is making good progress. TIGHAR veterans of expeditions aboard 120 foot Nai’a find there is much less rock n’ roll aboard a ship more than twice that size. So far, no one seems to be having trouble with seasickness except one of the dogs who is now on meds and doing fine. Yesterday the passengers were introduced to Berkeley, Piper, Marcy, and Kayle who gave a demonstration of their amazing olfactory ability. The passengers were also briefed on what the divers from the Woods Hole Oceanographic Institution (WHOI) will be doing. On a previous New England Aquarium trip to Nikuaroro, they implanted transmitters in 120 sharks. (You can try this at home. Lasso shark, rub tummy until shark falls asleep, cut slit in tummy, insert transmitter, sew up slit, release bewildered shark.) 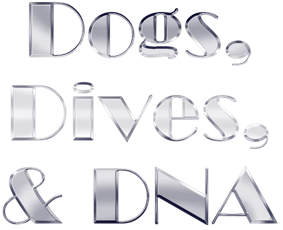 The WHOI divers then installed a number of sensors at various locations around the edge of the island at a depth of 30 feet. Every time a tagged shark passes nearby, the sensor records its presence. During the expedition the WHOI divers will service the sensors and retrieve the collected data. The purpose of the project is to learn whether the sharks at Niku range far and wide or stick close to home. Reef Endeavor is calling at Rotuma today where the passengers will have a chance to stretch their legs on dry ground and appreciate the local culture before resuming their voyage to Nikumaroro. At a briefing last night they learned that those legs, male or female, must must be dressed in a traditional sulu, also known as a lavalava, a wrap-around calf-length skirt. No hats may be worn and sunglasses must be removed before engaging in conversation. Children must not be touched, especially on the head. 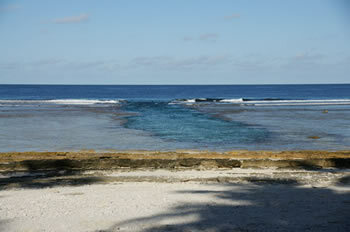 They’ll only spend about two hours on Rotuma so as to be sure to arrive at Nikumaroro at high tide on the 28th. It’s only possible to get a skiff through Tatiman Passage and into the lagoon at high tide. 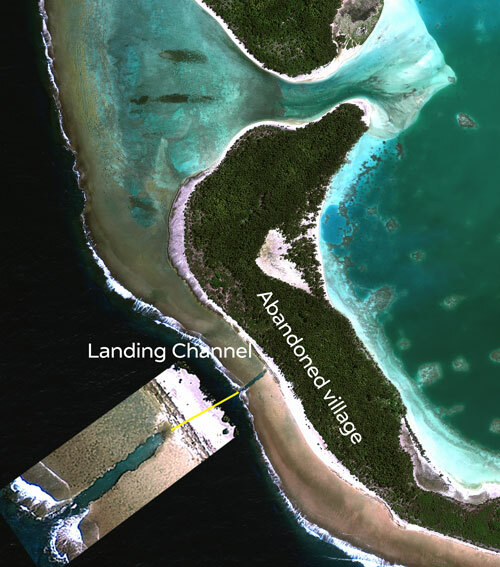 The technique is to bring the skiff up to the beach via the landing channel and then walk it northward and around the corner through the passage and across the sand delta into the lagoon. 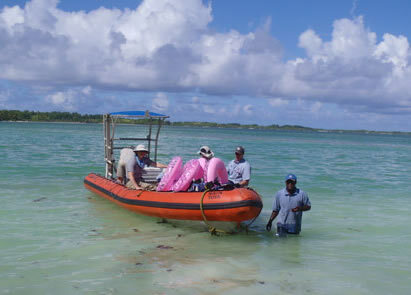 A skiff based in the lagoons is essential for transporting people (and dogs) to distant parts of the atoll. Nikumaroro is a room with one door. All traffic to and from the island is via the landing channel.. When the ocean is calm and the tide is high, coming ashore is easy. 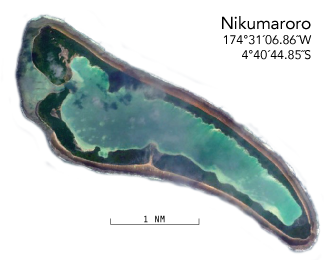 When the British colony was abandoned in 1963 a channel was dynamited through the reef to facilitate the evacuation At low tide on choppy days, not so much. On really rough days, discretion is the better part of valor. Thomas F. King, Ph.D., is the organizer and leader of TIGHAR’s participation in the Betchart 2017 “In Search of Amelia Earhart” expedition. Tom has been a member of TIGHAR since 1987 and serves on the Board of Directors as TIGHAR’s senior archaeologist. He has participated in five TIGHAR expeditions to Nikumaroro (1989, 1997, 2001, 2007, 2010) and supervised volunteers during Betchart’s 2015 visit to the island. 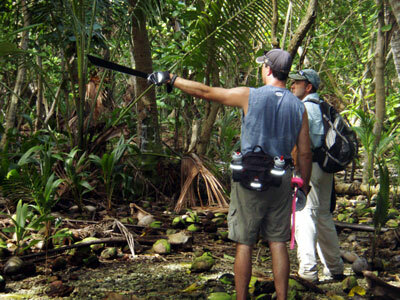 On this expedition, Tom will instruct volunteers in basic archaeological principles and techniques during the voyage to Nikumaroro. At the island, assisted by a staff of experienced TIGHARs, he will oversee onshore investigations at a number of sites and work with National Geographic archaeologist Fred Hiebert to direct the search for human bones by four forensic dogs from the Institute for Canine Forensics. 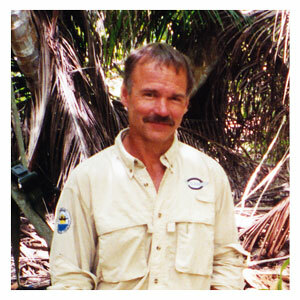 Tom has written numerous books on archaeology and cultural resource management. With regard to Amelia Earhart, he is the principal author of Amelia Earhart’s Shoes – Is the Mystery Solved? (AltaMira Press, 2001) and has written two novels, Thirteen Bones (Dog Ear Publishing, 2009) and Amelia Earhart on Norwich Island (available in draft form HERE). Dateline: 23 June 2017, Fiji. The dogs have arrived and are currently resting in quarantine at a veterinary clinic near the airport, and will be released tomorrow if not sooner to board the ship. Most of the other passengers have arrived this a.m. from LAX, so we are meeting each other and talking all things Nikumaroro. The island goddess Nei Manganibuka seems to have a thing about ROVs. 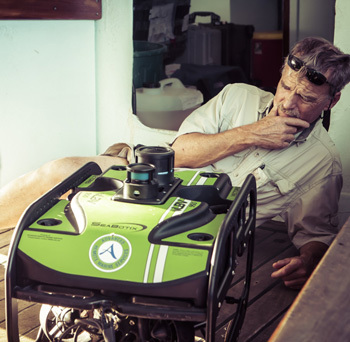 In this photo from the 2015 expedition John Clauss puzzles over the Seabotix ROV that refused to work..
You want the good news, or the bad news? After testing the ROV in the pool for 40 minutes, it stopped working. John and I spent a lot of time trying to figure out what the problem was, working with the controllers and tablet thinking it was a connectivity problem, but in the end came to the conclusion that there was a problem inside the unit. Frantic calls to OpenROV ensued. After several consultations, it was concluded that indeed something was seriously wrong with the unit we had. The symptoms were suggesting that water must have gotten inside the vessel making it very unhappy. Not good for electronics. Dead ROV. Not good for our expedition. Nei Manganibuka strikes again! Now the good news. OpenROV scrambled into action and they are sending a replacement unit down from LAX this evening with a passenger who is carrying it on as hand luggage, so we'll have it in time before we sail tomorrow afternoon. We're going to send the unit we have back to them for a post mortem. Keep in mind that what we are talking about here are pre-production prototypes of the Trident ROV, so it is not unusual to have some issues. In another month or so, OpenROV will be completing the final touches on their units and looking to start production, but in the mean time we're working with a prototype. Hats off the the OpenROV folks for making a special effort to get us a replacement unit. We're lucky that they are willing, and that there is one passenger who is still in transit. Fingers crossed that the unit gets delivered to the flight at LAX tonight. Dateline: 22 June 2017, Fiji. Negotiations with Fiji and Kiribati to obtain all the right permits and permissions to brings dogs into these countries went right down to the last minute wire, and Nat Geo didn't want to put out any press until they were sure all the boobies were lined up. Thankfully, it all got straightened out just a few days ago, and the pooches are a go, business class from LAX to Fiji nonetheless. There are several test projects we're going to put the dogs through before taking them to the Seven site so there will be ample opportunity for them to demonstrate their talents. Should be interesting to say the least. 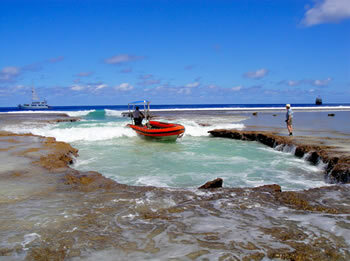 We’ve deployed lots of different technologies at Nikumaroro over the years, some of which worked well – KAP photography and pneumatic loppers for example – and some of which were utterly defeated by the Island Goddess Nei Manganibuka, such as the ROV in 2015 or the ground penetrating radar unit in 2010. I’m hoping the dogs will prove effective, at least they don't have motherboards to fail. We’ll see how the Niku environment treats them. I think this is going to be a really fascinating aspect of the trip. Unfortunately, I’ll be occupied with water and underwater based activities much of the time. Update on that will come shortly with additional interesting things we’re planning. 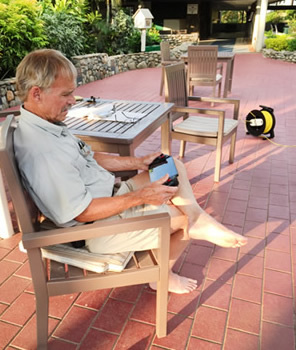 John Clauss tested the Trident OPEN ROV in the hotel swimming pool, much to the astonishment of other hotel guests. The ROV is controlled through an Android tablet with a game controller that attaches around the tablet. 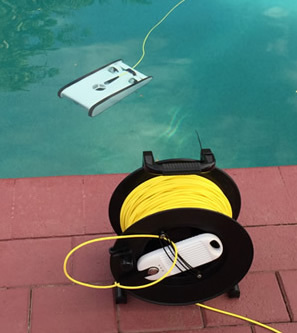 The game controller talks to the tablet via Bluetooth, and the tablet talks to the ROV via a wireless router at the dry end of the tether. When operating the ROV, you see the image on the tablet of what the ROV is seeing out the front camera of the unit. 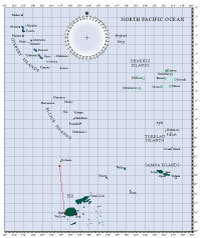 Most of the Betchart passengers were scheduled to depart LAX for the flight to Fiji late last night. At last report, the dogs were about to board the plane – as mentioned above, Business Class. If you support our efforts to solve the Earhart mystery please join TIGHAR. We need your help. Click here for several options. Thanks. Dateline: 21 June 2017, Fiji. 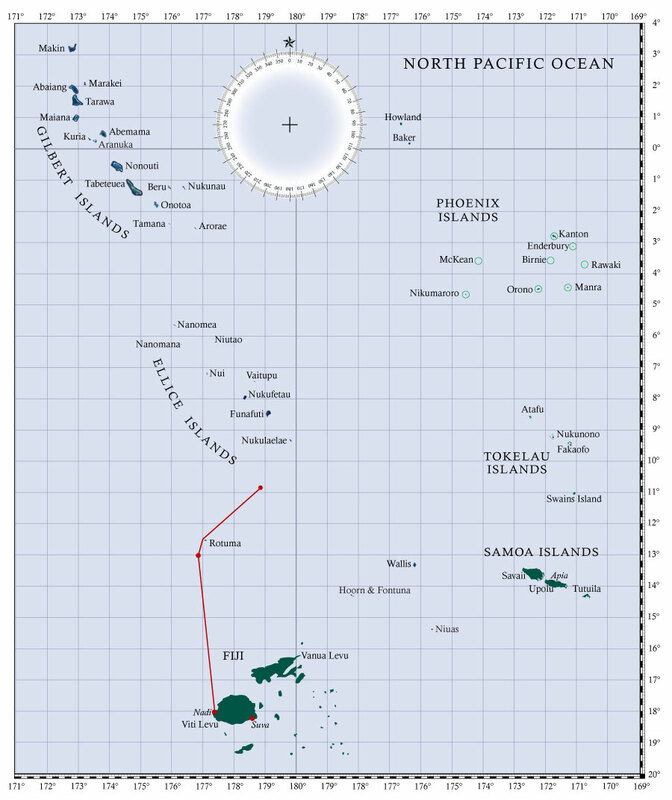 Several other TIGHARs and I are off to Nikumaroro this week for another round of exploration and searching. This trip is being conducted in conjunction with Betchart Expeditions which is a little bit different than past expeditions, but the way I see it is that we have to take advantage of any opportunity to get out there that presents itself. In a way, I think that the larger group may provide some benefits in that we increase the number of man hours per day on the island, which helps make up for the short duration of the visit – about 8 days. The TIGHAR researchers/veterans going this year include me, Tom King, Dawn Johnson, John Clauss, Kenton Spading, Joe Cerniglia, Tom and Maria Roberts, and Art Rypinski. There are also several folks who were on the Betchart expedition in 2015 that overlapped with Niku VIII that are going back again this year, so we have a pretty good core of experience TIGHARs participating. Click on the photo to open a larger version on a new page. Tom King, with Tom Roberts and Art Rypinski assisting, will be leading several shore based projects over the days we’ll be at Niku including work at the NW tip, Village, and the Seven Site. Kenton Spading will be leading work projects in Aukairame near Baureke passage (see annotated map at right; click on the small image to open a much larger one in a new window). Joe Cerniglia will be doing some bottle research in the village. John Clauss will be working water based projects including some metal detecting in and around the Tatiman Passage, some light ROV work with an Open ROV unit, and I’ll be working with folks who want to dive some targets on the reef that we’d like to explore further. We will also be assisting some divers from Woods Hole to locate, recover, and replace some sensors they placed several years ago. There are many, many details that have gone into the planning of this expedition that I’m not going to bother you all with, but suffice it to say that we’re going to do our best to deploy the best technology available to us (including some new and different search techniques) on the targets we think are the most interesting given the amount of time we have available. There is never enough time, resources, or technology available, but we do the best job that we can in a very tough location. If we weren’t optimistic that we’ll discover something that advances the project, we wouldn't go. While we can hope for a fantastic conclusive discovery, usually we don’t know what it is that has been discovered until after we get it back to the US and analyze what it is and how it might be related. I’m looking forward to this expedition and the results it will provide. Nikumaroro is truly a magical place. Here’s hoping it reveals more of its secrets to us this time. Also today, National Geographic announced their sponsorship of forensic dogs which will accompany the expedition to search for human bones at the site where the remains of a castaway were found in 1940.